Travel | ETP Symposium Inc.
Bishop’s University is after the bridge, so take the first entrance immediately (20 feet) after the bridge. Be careful, you cannot enter from the second road onto campus, it is EXIT ONLY. If you miss the first entrance, take the third (Sport Complex entrance). You may also use Google Map, but please be advised that the directions this tool provides are different from above. Daily service from Montreal to Sherbrooke is available from Station Centrale d’Autobus (505, boul. de Maisonneuve est 514 842-2281). The trip is approximately two hours in length, arriving in downtown Sherbrooke, a short taxi or city bus ride from the Bishop’s campus. Sherbrooke is not currently served by major airlines. 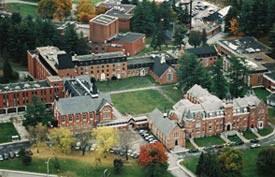 Burlington International Airport (BTV) – approximately 2 ½ hours drive from Bishop’s campus. Via Rail does not currently service Sherbrooke. However, there is a bus from Pierre Elliot Trudeau Airport and Central Station (VIA) to Station Centrale d’Autobus downtown Montreal providing bus service to Sherbrooke.